Kronos Quartet is a string quartet founded by violinist David Harrington in 1973. Since 1978, the quartet has been based in San Francisco, California. The longest-running combination of performers (1978?1999) had Harrington and John Sherba on violin, Hank Dutt on viola and Joan Jeanrenaud on cello. Jennifer Culp replaced Jeanrenaud on cello in 1999. Jeffrey Zeigler replaced Culp on cello in 2005. Recently, the Kronos Quartet began a commission process for composers under the age of 30, in the hope of bringing some of the talented young composers of our day to light. Kronos specializes in new music and has a long history of commissioning new works. 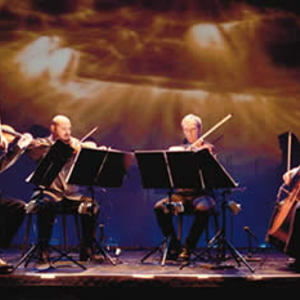 In fact, over 600 works have been created for the Kronos Quartet. They have worked with many minimalist composers including Steve Reich, Philip Glass, Terry Riley and Kevin Volans. Kronos has collaborated with composers from diverse countries such as Franghiz Ali Zadeh from Azerbaijan and Osvaldo Golijov from Argentina. Golijov is a MacArthur Fellow who has done compositions and arrangements for Kronos CDs such as Caravan and Nuevo. Kronos covers a very broad range of musical genres: Mexican folk, experimental, pre-classical early music, movie soundtracks (Requiem for a Dream), jazz and tango. Kronos has even recorded adaptations of Purple Haze, Flugufrelsarinn, Marquee Moon, and Dinner Music For A Pack Of Hungry Cannibals. Composers aside, Kronos has teamed up with artists from around the world, including the legendary Bollywood "playback singer" Asha Bhosle; the American soprano Dawn Upshaw; Mexican pop-rockers Cafe Tacuba; and the Romanian gypsy band Taraf de Haidouks. Kronos has performed live with the likes of the late poet Allen Ginsberg, Modern Jazz Quartet, David Bowie, and Bjork, and has appeared on recordings with such diverse talents as singer-songwriters Dave Matthews, Nelly Furtado, Rokia Traore, Joan Armatrading, and Texas yodeler Don Walser.